Pakistan is almost water scarce today, with an alarming rate of 1,017 cubic meters water available per capita annually, which is dangerously close to 1,000 cubic meters, the threshold of water scarcity. Unfortunately, Pakistan has failed over the past years when it comes to improving water governance and taking corrective measures for saving the rapidly worsening water situation. 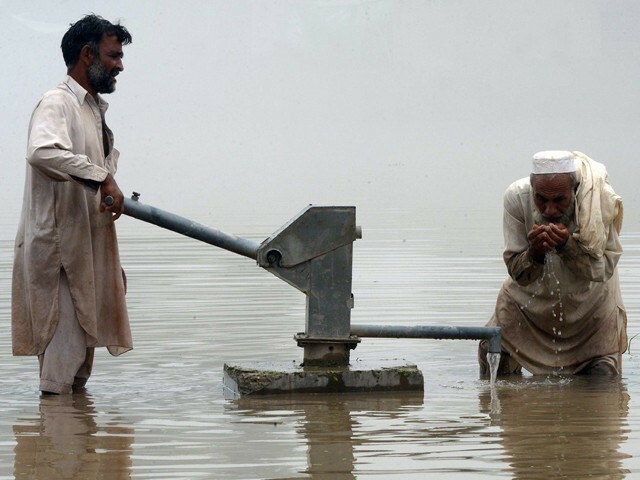 Water governance mechanics in Pakistan are loose, out-dated, and inefficient. The federal government has not been able to reach a consensus for decades on the topic of building large dams. Similarly, Pakistan has also failed on diplomatic fronts, it has not been able to persuade or deter India from obstructing downstream river flows by building dams. Whereas, on the other hand, the aquifer in the Indus Basin, Pakistan’s chief water source, is rapidly depleting with little or no signs of recharge and is considered the second most stressed in the world. The latest report published by the International Monetary Fund (IMF) highlights that the per capita annual water availability in Pakistan has dropped alarmingly. Against a dismal supply of 191 million acre feet (MAF), the demand for water is projected to escalate to 274 MAF by 2025, culminating into a deficit of 83 MAF. The report claims that Pakistan has the world’s fourth highest rate of water use and is already the third most water-stressed country in the world. What’s more frightening is the fact that Pakistan is going to become a water scarce country at a rather faster pace than projected in a report by Woodrow Wilson International Centre for Scholars, which had predicted back in 2009 that Pakistan would not face water scarcity until 2035. The report by IMF recommends that the use of water by the agriculture sector, which uses more than 90 per cent of Pakistan’s water resources, should be taxed. However, the recommendation is rather self-serving, and reflects a complete disregard for the ground realities in Pakistan. Pakistan’s agriculture sector is already dying a slow death, there have barely been little to no reforms over the past 67 years, the government has withdrawn most of the subsidies granted to the agriculture sector, putting it in a disadvantageous position vis-à-vis neighbouring competitors. Over the decades, the government has spent a very little amount on research and development of new seeds or advocacy of modern farming practices resulting in low yield at higher costs. Similarly, agricultural markets are not well-organised and are inefficient, leaving farmers at the mercy of middlemen which erodes the welfare of farmers and end consumers simultaneously. Farm sizes keep decreasing due to transfers and inheritances and resultantly about 95 per cent of the total 5.3 million farms have an area of less than 12.5 hectares, whereas only 5.6% of the total farms have an area of more than or equal to 12.5 hectares. This affects the purchasing power of small farmers’ who do not even have access to formal credit schemes to purchase seeds, pesticides, and fertilisers, etc. These farmers find themselves at a sheer disadvantage when dealing with middlemen or mill owners. Already financially constrained, these farmers can neither hold back their crop nor is it advisable as it would dry up the weight of the crop and thus farmers are forced to sell their crop at below market prices. In view of the above issues, taxing the agriculture sector as a measure of conserving water does not seem to be directed at saving Pakistan from becoming a water scarce country, instead it is more of a government revenue enhancing measure. Tax as a policy instrument for water governance could be an erosive welfare for an already dying agricultural sector. Since it is not possible to build large dams imminently due to the reasons that they are controversial expensive, plus the government is already heavily indebted and a greater part of its revenue is spent on debt servicing, measures such as designing policy instruments and regulation for sustainable consumption and conservation of water could be least expensive and most effective given the ground realities in Pakistan. A report published by the World Wildlife Fund (WWF) mentions that 50 to 60 per cent water is wasted due to inefficient and leaky irrigation systems, wasteful field application methods, and the practice of growing ‘thirsty’ crops. This is where the opportunity for Pakistan to conserve water lies. If we solve this part of the equation, we can probably make up for the dams we are unable to build. The government may consider formulating regulations to discourage the archaic method of flood irrigation which is the major reason for water wastage and instead, replace it with drip irrigation system, something which is being practiced in many other countries. This will enable water conservation and would not be a cause of financial burden on the government, except for the cost of implementation of the regulation, for which budget is already allocated to provincial government departments. The farmers would have to incur costs for drip irrigation in the short run, but its welfare effect would be far more positive than paying taxes on the use of water or rather water being wasted due to leaky irrigation systems. The government may also formulate regulations to prevent water leakage by demanding farmers to construct cemented water channels passing through their farms, which are connected to canals. The second most important intervention could be the regulation of crops to discourage notoriously thirsty cash crops which neither make economic sense nor contribute to national welfare. For example, the average water requirement of sugarcane is 1,800 millimetres (mm) which is more than the combined average water requirement of wheat (480mm), maize (550mm) and cotton (620mm). Sugarcane farmers have to call strikes to negotiate prices with mill owners who, on the other hand, pressurise the government for freight and export subsidies, the government then regulates the import of sugar, applying hefty duties on imports to protect the local sugar industry which results in the erosion of consumer welfare to such an extent that when internationally sugar is sold at Rs40-45 per kilogram (kg), the consumers buy it from local producers at a rate of Rs55-60 per kg. Under these circumstances, even if government bans the sugarcane crop, it would not only be overall beneficial for our national welfare, but would also save ample reserves of water for as many as three crops at least. Pakistan needs to adopt aggressive policy reforms and look beyond the traditional policy tools, which wear away the welfare of the concerned citizens as well as fail to address the issue effectively, in order to avoid becoming a water scarce country. Q: Why Pakistan will soon become a water scarce country.. Some days back i was talking to an educated Pakistani in Canada , he came up this jaw dropping theory . wanna hear ? Indians are stealing electricity from Pakistan water ! this is the level of Pakistani brain ! I’m simply amazed at the continuous stream of untruths dished out to you people. In spite of losing so many cases at international tribunals, in spite of your own educated and knowledgeable people admitting that India does nothing which hampers flow of water to pakistan, still you people are fed such stuff.